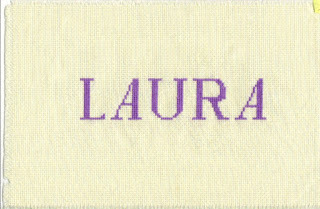 The smooth look and simplicity of counted cross-stitch work on the fabric is part of the appeal, but cross-stitch can be too plain, particularly with alphabets. That's when you need a fancy cross-stitch alphabet or maybe need to try something different. With some alphabets, when you put letters together counting spaces between them, they just don't look right. That's because the eye is drawn to the mixture of diagonals with vertical lines. The diagonal "A" in the alphabet I'm using here makes it look as if the distance between the letters isn't the same. It is. 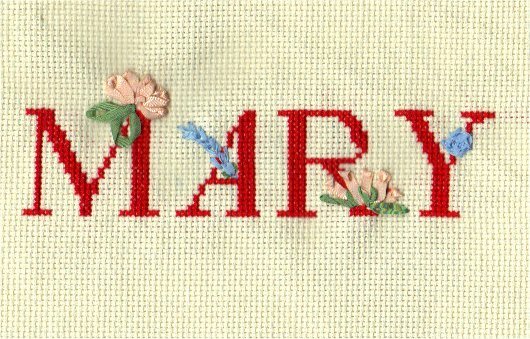 You can mix cross-stitch with ribbon embroidery to improve the look of a plain cross-stitch name. You may also be able to overcome an error you've made if you've miscounted. Instead of taking your work out and starting over, try something that may even improve the look. Here's one I've been playing with in an attempt to see how silk embroidery works on Aida cloth. It's pretty easy to do, and with a little more work, this might be usable. We have some cross-stitch alphabet books for sale if you want to try your luck at this. You might find an alphabet with flowers that you can change from cross-stitch to silk ribbon embroidery stitches. I'm always experimenting with needlework crafts to create one-of-a-kind items. 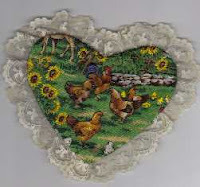 Mixing cross-stitch with silk ribbon embroidery seems as if it could be interesting. 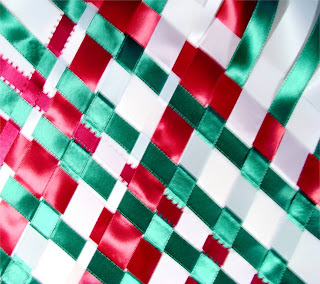 Some fabrics have strips of design elements throughout the fabric and some have the strip at one or both ends. These fabrics make beautiful skirts, and Daisy Kingdom cornered the market on little girls’ dress fabrics several years ago. 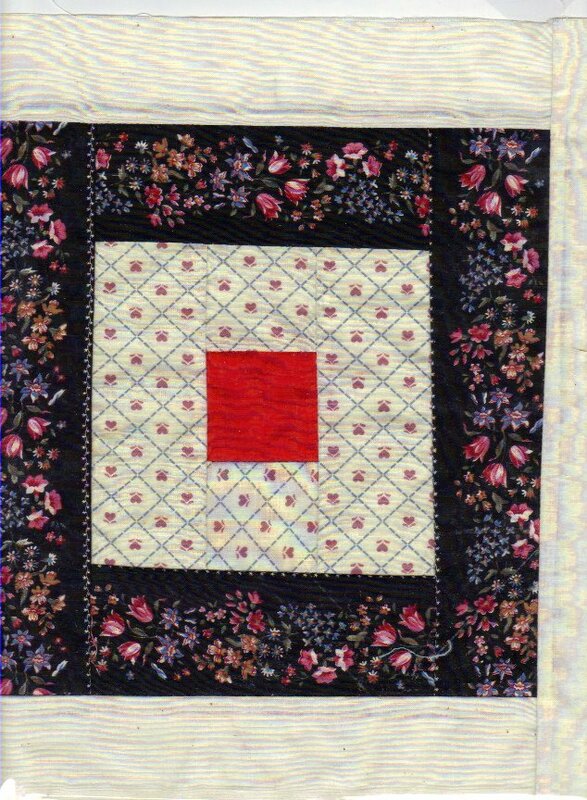 If you have any border prints, consider using them for quilting or for making pillows. Check the print by tearing it along the edge of a border design. You want to see if the printing is straight on the fabric. Surprisingly, most border prints are accurate. That’s not true for all printed fabrics, and it’s important for quilting or piecing that the fabric is printed straight with the fabric threads to avoid visible errors. 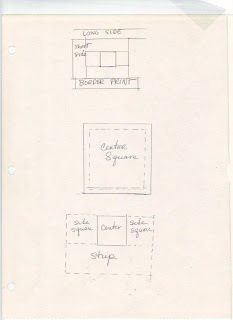 Select contrasting fabrics, and plan a design or find a pattern you like. You’ll need a design that uses strips of fabric, not circles or wedges. Log cabin style designs are ideal, and you can make your own design by starting with a center square in the size you want to work with. I use at least 2 1/2 inches for center squares, and that makes a 2 inch finished center. If your border print is 2 1/2 inches, it will look like you did some careful planning. Make some fabric strips to start -- a light color if your border print is dark or a dark color if your border print is light. It doesn’t have to be a solid color -- try small prints or monochromatic designs. Add a block on each side of the center block. It will be the same size as the center. Using one of your long strips of fabric, add a strip on each side of the three blocks and cut off at the end so it’s even with the 3-block square. 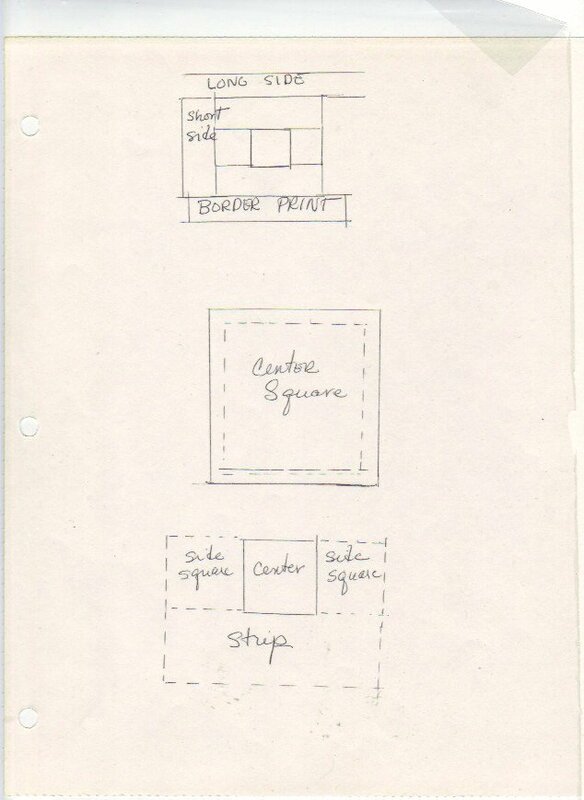 Your design will now be a center square with a square around it. It’s time to try your border print that you’ve cut into a strip. 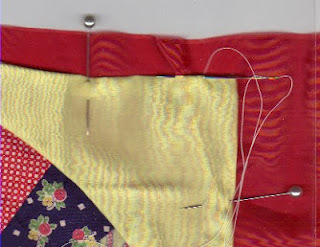 Add that strip next and cut at the end or let it extend beyond the edge by the size of the border. In other words, if your border print is 2 1/2 inches wide, leave 2 1/2 inches on one end before you start to sew the strip to the block. You can make two long sides and two short ones or you can make all four sides the same. Border prints seem to do better with two short sides and two long ones. Add another strip beyond the border print if you want large quilt blocks for a pillow or a quilt. Appliqué pillows, quilt blocks or craft pieces available for purchase at crafts fairs and thrift stores are sometimes inferior quality. 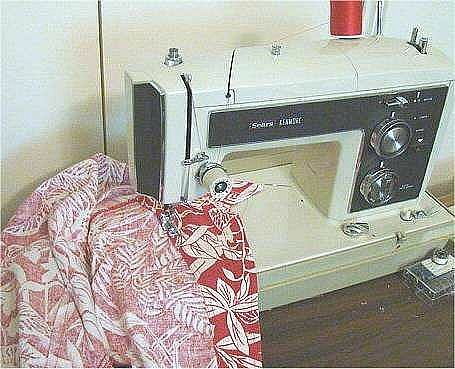 The crafter has done a nice job, but has used fabrics or techniques that make the work look less than professional. 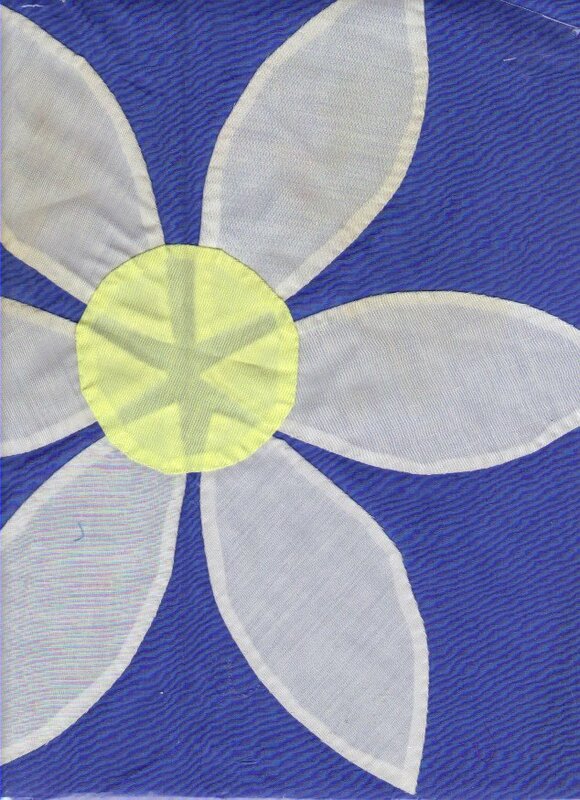 Here’s a blue background with white flower petals and a yellow center. The crafter has spent hours on the handwork, but it has several “issues” that you’ll want to avoid. When you’re choosing fabrics to appliqué, pick heavy cottons or fabrics that won’t show the background through. 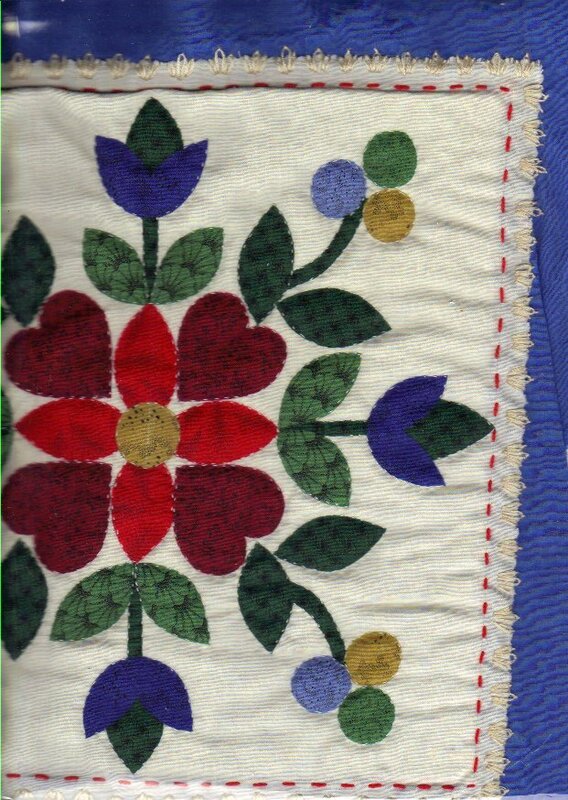 If the crafter had used the blue for petals on a white background, the design would be more attractive. The white wouldn’t show through the blue petals the same way the blue background shows through the white petals. Then, there’s the center. The yellow fabric is polyester and cotton, too thin for the appliqué. As a result, the white petal parts show through the yellow center. REMEDY: You can speed up your appliqué process and keep the background from showing through by using double layers of fabric for the petals. Cut two of each and match fabric front to fabric front. Stitch around the petal, leaving an opening for turning. 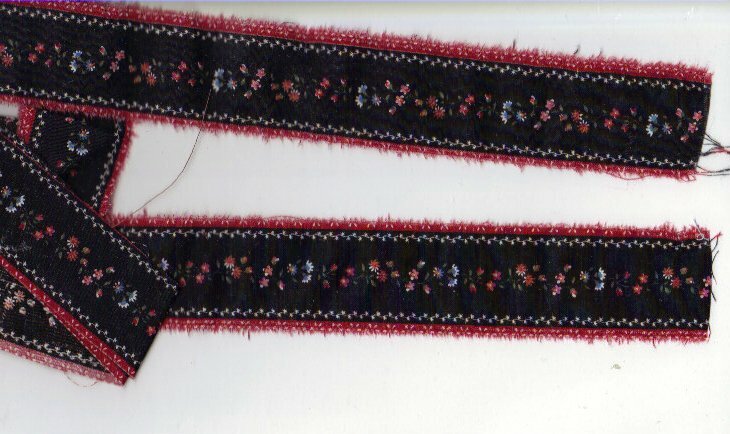 The easy way to stitch this is with the sewing machine. Turn the petal and press around the edge. 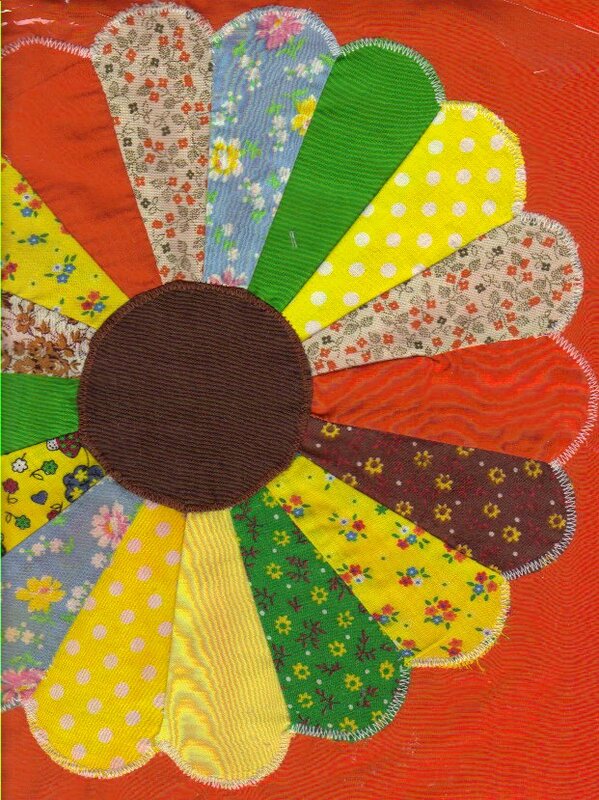 Attach the doubled fabric petal in place and whip stitch, blind stitch or machine stitch in place. You don’t have to turn edges as you go, you have a double layer of fabric and your finished product looks professional. Another “fix” for the yellow center that shows background fabric through like this is to use batting to “stuff” it like you would for a biscuit quilt. Open one edge and use a knitting needle to push the batting into the center. 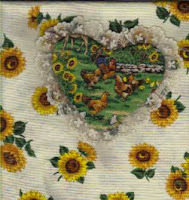 Once you make a puffy center, you’ve covered the background fabric as well as made your appliqué look 3-dimensional. 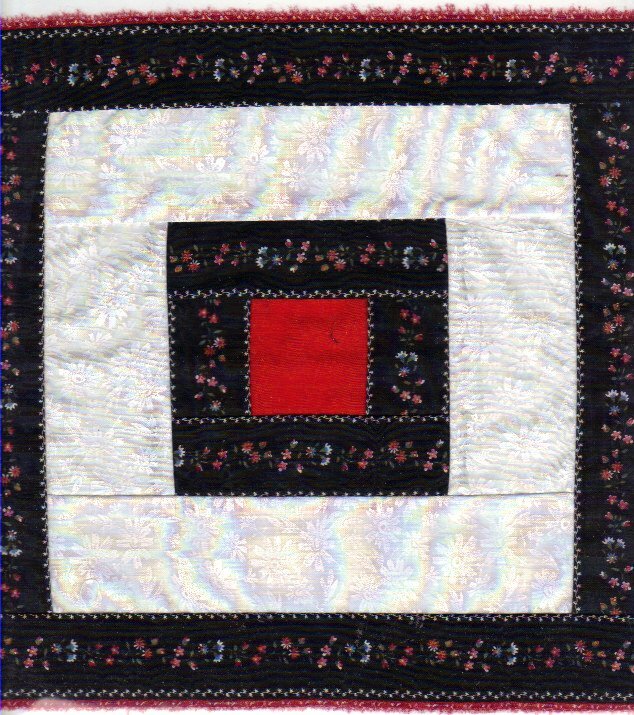 Whipstitch is an acceptable stitch for appliqué, but the blind stitch is more attractive. REMEDY: If you aren’t familiar with the blind stitch, you can learn it in a jiffy and use it for your next appliqué. With an appliqué placed on the background fabric, start the blind stitch by pulling the threaded needle through the appliqué edge at the fold. Take a tiny stitch to anchor the thread, and another tiny stitch to catch the back fabric. Bring the needle through the back fabric and slide it through the folded edge of the appliqué for about 1/4 inch. Catch the background fabric again and bring the needle forward to the appliqué, slide it through the folded edge, and you’re making fast tracks with the blind stitch. If you want to machine stitch your appliqué, you can work with a small zigzag stitch. This Dresden plate block shows how easy it is to use the sewing machine to finish the edge of the appliqué. This one doesn’t have the edge turned under before zigzagging. It lies flat and is easy to sew, but after many washings, the fabric will fray along the edge. If you want to make your appliqué last, double fabric and turn as discussed or turn all raw edges under before stitching. You don’t have to be a perfectionist to have fun crafting, but you’ll want to avoid major goofs. 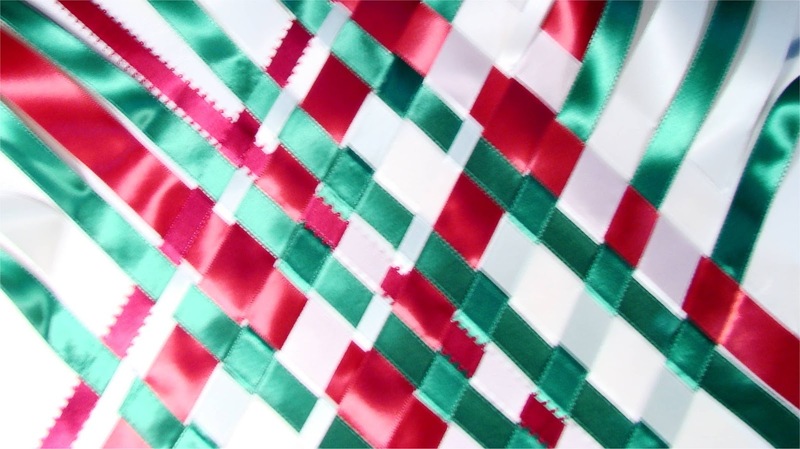 Polyester and cotton fabrics are often too thin for appliqué or other quilting projects because the seams show through. 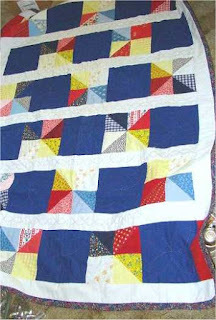 One-hundred percent cotton has been the choice of quilters for years because it looks best and it’s easier to quilt. 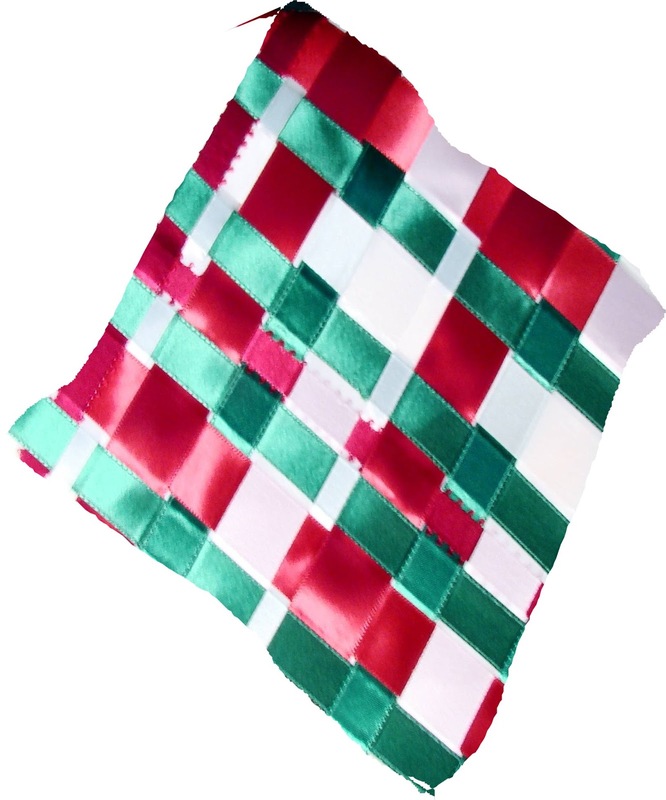 That brings us to another way you can improve your quilting and appliqué. Don’t use polyester and cotton sheeting fabric for anything to do with your crafts. It’s very difficult to quilt or hand-sew sheeting fabric I learned in high school. I took two sheets and made a coverlet for a 4-H project, with a diamond design overall. It was some of the most difficult handwork I’ve ever done. It wasn’t worth it, even for a blue ribbon -- but once I had it started, I couldn’t start over. Learn from my mistakes. 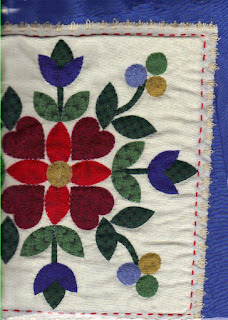 Skirt from Peru has applique and embroidery. You've seen the cost of sewing thread, lace and all things wonderful for sewing and crafting at the fabric store. Whether you can afford these sewing notions isn't the question. They add to the cost of sewing and needleworking as a hobby, and take away some of the thrill of the bargain. You can find wonderful fabrics and embellishments for your crafts projects at the thrift store. 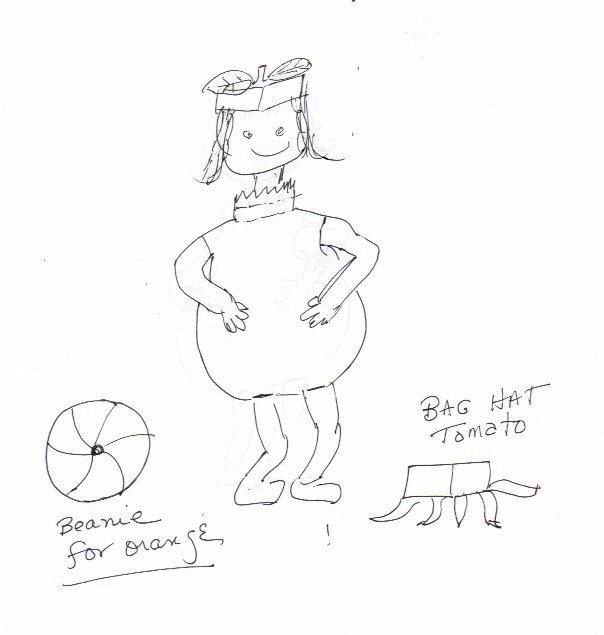 Use your creativity to recycle them into something splendid. Many thrift shops are operated by non-profit organizations to help those who need. Some of the thrift stores in Texas help hospice-care patients and others are operated by church groups to provide food or financial assistance to families. Whatever the purpose, some of these are ideal crafter's hideaways. Scarf prints and fabrics are fashionable this summer, "Good Housekeeping" reports in the June 2012 issue. The thrift store usually has a bin of scarves or they may even have them hanging on a rack. You're interested in scarves you can use for crafts and sewing projects. Most scarves have a tiny tag near a corner that identifies the country of origin and the fabric. Skip the polyester and fine silk scarves unless you have a special project for them. Look for the heavier fabrics such as rayon or cotton. Rayon scarves may feel rough, almost like a fine wool and are often 36 inches square. Cotton scarves have a bandanna look and weight. These are scarves you can use for crafts, quilts or fancy pillows. Colorful hankies are another small fabric item you'll want to check at the thrift store. Some thrift stores have donated fabric and crafts and sometimes thread, but you'll want to check out large fabrics. The bedding section has bedspreads and comforters. Don't look at them as bedspreads, but envision them as fabric for your crafts. You don't even have to rip the seams -- just cut within half an inch of the seam to get a large flat piece of fabric for crafting. Check out the embellishments. Eyelet is expensive at the fabric store, but you may find a comforter or even a sheet with eyelet around the edge -- more eyelet than you'll need for most crafts projects. Look at the clothing. You don't care about the size -- you're looking for lace, artistic designs and pieces you can use for crafts. Machine embroidery around the bottom of a skirt or dress makes a border print for crafting. Check the artwork. Framed needlework crafts are usually in with the framed art and you may find something you can recycle. Old embroidery, cross-stitch and blackwork can be washed and made into a pillow or added to your next decorated shirt or skirt. 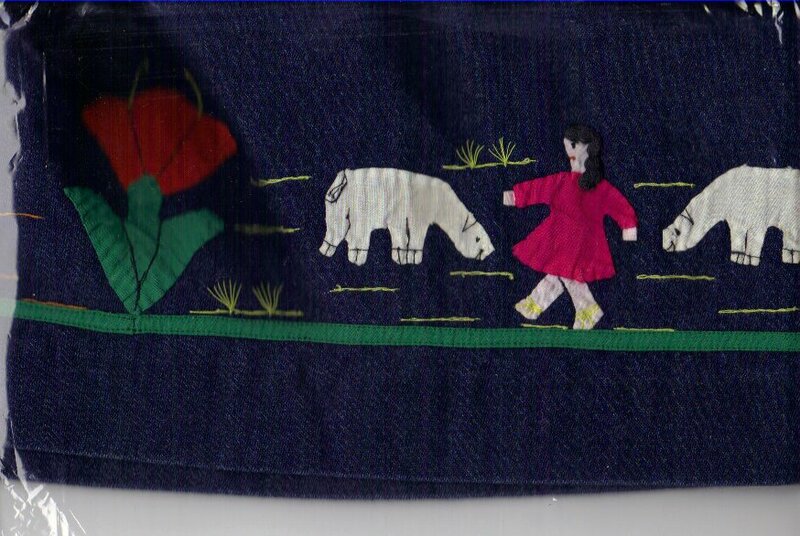 The picture at the top is applique from Peru and is part of a denim skirt found at...you guessed it -- the thrift store. 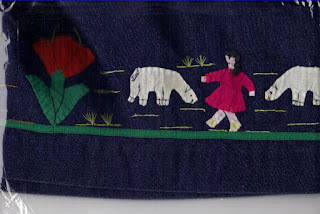 Embroidered pieces with damage on the outer edges can be cut out as appliques. Just leave half an inch or so around the edge of the design area. Stitch around the edge with the sewing machine where you want to fold it back for the applique and fold to the wrong side of the fabric on the stitching line. 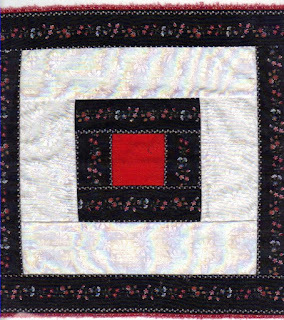 You can applique the piece in place by machine or by hand with tiny stitches. You'll want to mark the scarf into triangles. If you want a 12-inch pillow, you'll need a 28-inch scarf or larger. Measure 14 inches from the corner along the edge each way and mark a dot. Strike a line joining the two dots to form a triangle. Measure from another corner and mark the dots and strike the line. Cut the two triangles off the corners of the scarf and stitch them together with a narrow seam for your pillow top. 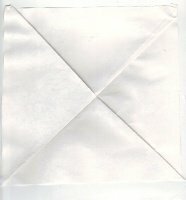 Fold the opposite corners right-side to right-side and make a "faux" seam diagonally to create the "X" down the center. Measure your piece and trim to 13 inches. 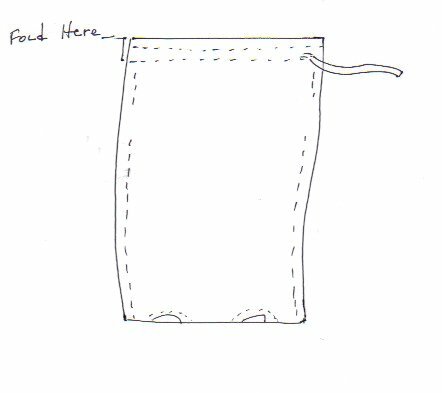 You'll have an inch extra for stitching the back to the front, so you'll need to use 1/2 inch seam allowances all around the edge. 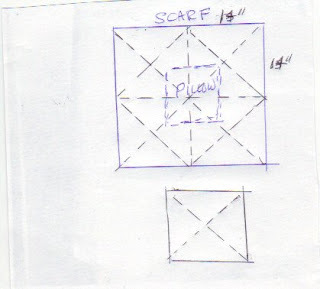 Here's what you can do with a single large scarf -- either use the center for a pillow or use the corners. 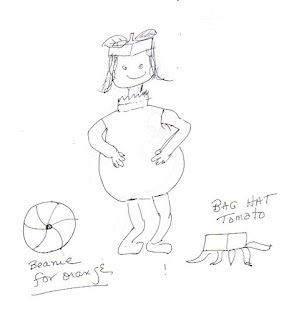 You may get two pillows from one large scarf, or possibly even three -- one from the middle and two from the corners. Have a great time crafting with recycled lace, embroidery, scarves and fabrics. See you again SOON! I was babysitting a few days while my daughter planted the garden, but managed to make some rounds to the thrift stores while in Arkansas. The new magazines show pillows as accents in nearly every room. The April 2012 Traditional Home has an article entitled "New + Next" subtitled "Patched for Perfection" with fabric ideas and fashionable colors. The April issue of Better Homes & Gardens shows pillows in the indoor-outdoor living area as well as pillow accents as color boosts for the bedroom. Making a pillow is an easy task for anyone who likes to sew, as you can make the pillow as simple as you want. Let the fabric do the detailing, and purchase a pillow form. You don't even need a zipper. Start with a size that a pillow form will fit -- they usually come in 10 inch, 12 inch or 14 inch squares. You'll need an extra inch of fabric for the front and 6 inches extra in one length of the back. 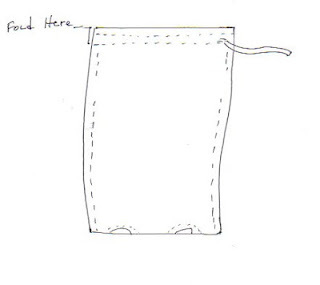 For a simple fabric pillow in a 10 inch size, cut an 11-inch square for the front and use 1/2 inch seams all around. Cut the back 11 inches long and 16 inches wide. Cut that piece in half on the large side to make it 8 inches by 11 inches. Fold under (wrong side to wrong side of fabric) 1/4 inch and stitch near the edge for each of the center seams. Fold again at 1 inch and stitch close to the previous stitching. Assemble pillow front to the back with straight pins, right sides together and working with the wrong side of the fabric up. Overlap the two back pieces where you've stitched so they fit the pillow front. The overlap should be about 2 1/2 inches. This overlap will allow you to place the pillow form in the cover and to remove the cover if you need to wash it. Stitch around all four sides of the pillow edge and turn to the right side. Push the pillow form from the open center in the back into one side. Squeeze the pillow form into the other side. Shopping thrift stores is a good way to find fabrics and even pillow tops that didn't get finished. I found some pieces that had batting and backing already stitched on a cotton fabric. It needed quilting to hold the batting in place, so I stitched around the design. I was concerned that the edges weren't stabilized, so I stitched around the pinked edge with embroidery floss, using a lazy daisy stitch that looks like maybe a leaf or flower, or maybe chicken tracks. Here's the result, and it cost 25 cents and a pillow form. Use a complementary fabric for the back -- don't try to match the colors. 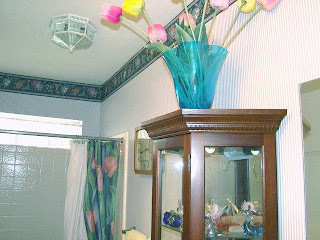 Have a wonderful spring season with crafts and decorating projects. The season provides the inspiration and you are the designer. 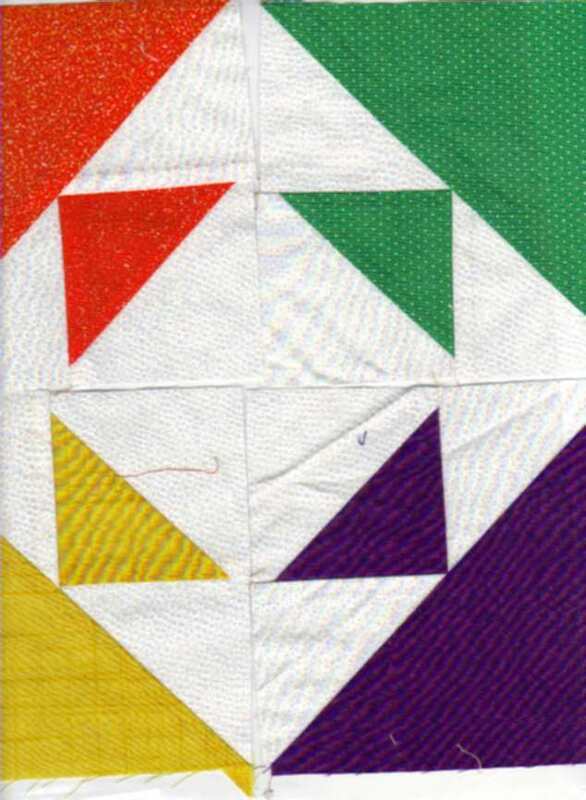 Quilting with squares is a great place to start quilting, but triangles make more interesting designs. 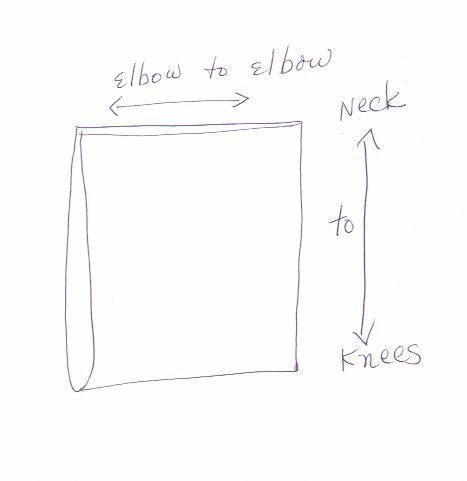 Triangles are nearly as easy to work with, and right-angle triangles are half of a square. Some quilting patterns suggest that you cut squares and divide them diagonally for triangles. You have to allow for the middle seam if you use that cutting method. The middle seam takes about 7/8 inch, so if you want 5 inch blocks, you'll need to cut 5 7/8 inch squares to cut diagonally for triangles. Speed up your piecing. Make two units at a time if you want two-color triangles. Cut the squares, but don't cut them into triangles. 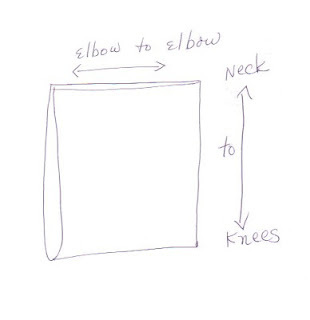 Place a light square on a dark square and draw a line for the diagonal. 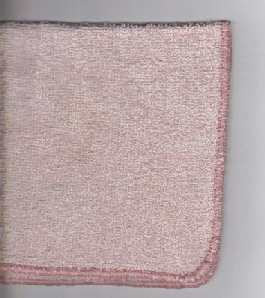 Stitch parallel to the diagonal on each side at about 1/4 inch distance from the line. Cut on the center line and press the seam toward the dark side. You have completed two units, each with a dark triangle and a light triangle. 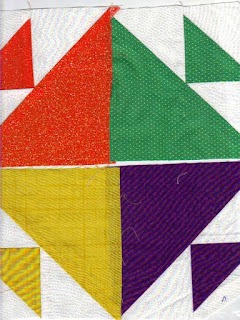 Two-color triangle squares are easy to make and have so many possibilities for artistic construction for a pillow or quilt. Here's a little variation. This design has one single triangle for half the square, and four small triangles for the other half. The small triangles are 3 1/4 inch squares cut in half on the diagonal, and the seams are a scant 1/4 inch. Four 5-inch squares make the block you can use for a pillow with sashing all around, or make more blocks for a quilt. 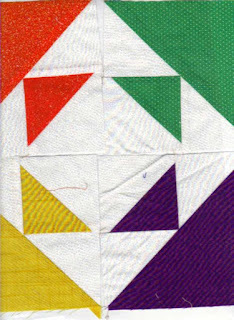 There are four pieces in the pieced half triangle pictured here. You can use the same speedy procedure above to make the small dark and light square. Then add a triangle to each side and stitch the center seam to complete the square. Look at the design difference just by moving the squares around. This gives you an idea of how half-square triangles create versatility in the quilting design. They are easy to work with and points that are sometimes difficult to match are not usually an issue with half-square triangle blocks. Maybe this is the inspiration you need to make a new pillow or quilt top. I made the blue quilt for my daughter when she adopted two babies last year.